Though they are the same as other types of banners in many ways, stage banners present a number of unique challenges. A typical event banner is hung indoors, in a controlled environment and is of a dimension to be seen by nearby passing foot traffic. Stage banners, by contrast, are often massive in scale and need to be able to withstand wet and windy conditions so that they can be hung outdoors. Denver Print Company does not shy away from meeting these challenges. We have produced large-scale stage banners for high-profile Colorado events such as The People’s Fair, Taste of Colorado, 420 Rally, Parade of lights, and Denver Comic Con. 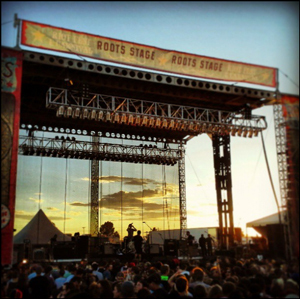 Stage banners usually come in two types, up-stage banners and down-stage banners. Upstage banners are generally hung at the back of the stage (behind the performers). 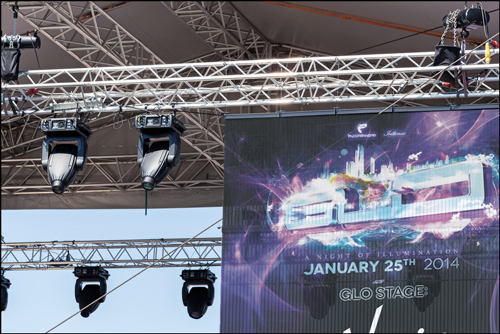 In a festival setting, these banners will usually display graphics and branding for the performer that is currently on the stage. Because they are typically hung for a shorter period of time, these banners are designed to be easier to hang. It is also not quite as important that these banners be weather-proof (though it’s still not a bad idea). Due to the fact that they are occupying the upstage from the performance, these banners are usually designed in a horizontal, or landscape, perspective. Down-stage banners are hung at the front of the stage and serve as a curtain, or frame, for the stage. These banners typically display graphics for the name of the event itself. They generally hang the entire height of the stage and are design in a vertical, or portrait, perspective. Because these banners are meant to hang for the entire length of an event and beyond, it is imperative that they be able to withstand wind and rain. Mesh banners are the ideal outdoor banner solution. They allow you to get maximum life out of your banners. In addition to stage use, mesh banners work great for construction companies, real estate agents, restaurants, barber shops, sporting goods stores, and event marketing. The typical mesh banner that is properly hung can outlive a standard vinyl banner by 1 whole year and longer. The transparency of mesh banners also makes them great to use in situations where vinyl or cloth banners just won’t work, such as on a fence. These spaces are often prime real estate for advertising. Mesh banners make that a possibility! Hemmed Edges Our most durable and economical finishing option. Grommets Allows you to hang your banner using rope or twine. Sewn in Rope To suspend your banner without having to find more material. Reinforced Corners Keeps the corners of your banner from fraying. Pole Pockets Allows you to hang banner horizontally from a pole. Velcro Mounting Used to attach your banner directly to a wall. D-Rings Another finishing option used for rope suspension. Webbed Corner Makes your banner more resistant to wind. Properly secure your mesh banner using all the supplied grommets. Use rope, zip ties or mounting nails. Always roll your banner up when not using it. Avoid folding as much as possible. Due to the vinyl patterns that mesh banners use it can affect how you design them. Denver Print Company is available to help design and print your next mesh banner. We offer Rush printing on all Mesh Banner sizes. Stock may vary so please call ahead. What is needed for a stage banner?